Pegboards are a funny thing. Nearly every workshop has some. The problem is not so much the pegboard, as the pegs themselves. Sure the pegs are great because you can move them around, but that is part of the problem, they wobble side to side when you try to hang a tool on them. The retainer clips help keep them from falling off the board, but do nothing to keep the pegs from wobbling. The clip does nothing to prevent the side to side waggle of the peg. Pegs that waggle are an annoying problem, but they are easily fixed with a bit of hotmelt glue and thin piece of wood. With a bit of hot glue holding the peg and the retainer clip to a small piece of wood, the peg is secure. 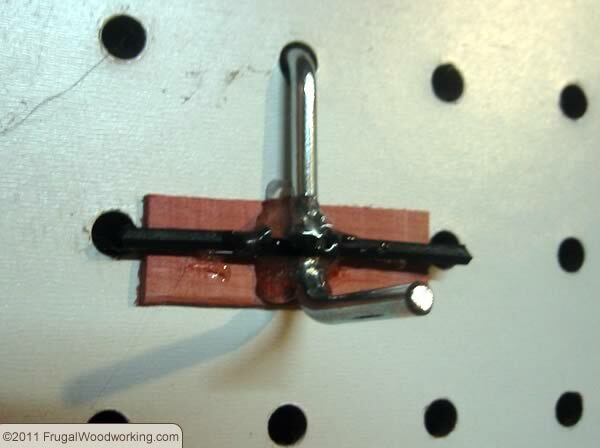 Simply hang the peg on the pegboard and slip a small strip of wood behind the clip, then press the clip in place. Now squeeze in a glob or two of hotglue to hold the peg to the clip and the wood. Then you are all set. 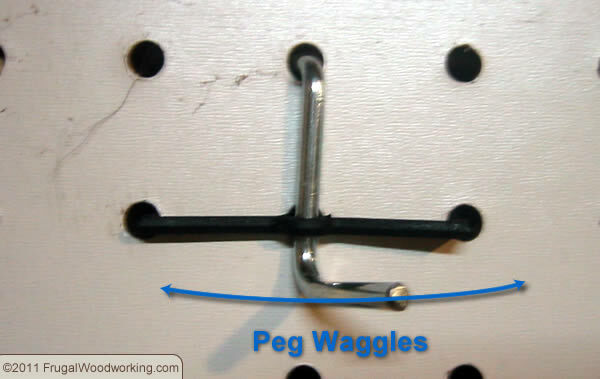 The peg can still be moved to other parts of the pegboard without any trouble, but once it is there, it wobbles no more.